Increasing numbers of people are looking for super supplements that offer REAL benefits. The World's FIRST Certified Organic Probiotic -- a wholefood supplement made from organic ingredients along with the very best types of beneficial bacteria and other advantageous micro-organisms -- called MiVitality InLiven, could just be the best natural food supplement you can buy. PLUS it might also prove the most beneficial. MiVitality InLiven is an amazing product that can genuinely help you reclaim your 'digestive fitness'. Doctor's are increasingly recommending a probiotic supplement particularly for older people; those who have been ill (and especially after taking anti-biotics which KILL off many GOOD intestinal bacteria, as well as bad! ); and anyone who suffers long-term digestive problems such as acid-reflux, indigestion and IBS. This is because it is now acknowledged that prolonged periods of poor eating habits, and the use of processed foods typically consumed in Western countries can contribute to a persistent imbalance in intestinal conditions. This can then lead to chronic conditions of the gut that leave you feeling lacking in energy, depressed, bloated, suffering bouts of diarrhea, constipation (or alternation between the two!!) as well as discomfort and/or embarrassing gas problems. MiVitality InLiven is one of the true super supplements because - (1) It is the world's first certified organic probiotic food supplement and (2) It provides the full spectrum of the most potent probiotic 'GOOD' bacteria that are vital to intestinal health. In fact the full range of Lactobacillus family of bacteria (13 strains in all) are included in this live 'wholefood' powder along with extracts derived from a wide range of organic vegetable sources including an organic source of the highly regarded 'super' ingredient, spirulina. This combination ensures that when the good bacteria reach your gut they too will have the necessary nourishment to establish healthy and effective colonies in the shortest possible time. Depending on how badly your system is depleted you may initially need upto 3 measures a day - one before each main meal - for a few weeks to start with. You can mix the powder with any type of fresh juice for a tasty 'smoothie', or drink it with water – preferably cold filtered or natural spring - or you can even sprinkle it on salads or other dishes. This level of supplementation can also act as a 'Detox', or cleanse, which is essential before being able to heal a badly affected gut effectively. InLiven probiotic powder can therefore be used to undertake an effective "colon cleanse" - which is periodically advised for almost anyone who typically consumes a 'Standard American Diet' (SAD), or Western diet such as consumed in the UK. Medical research has shown that consumers of such diets tend to have a negative balance of intestinal flora of about 80/20 in favour of 'bad' bacteria. A typical 'maintenance' dose of InLiven, just ONE measure a day, ideally in the morning before breakfast is all that is then needed by most people. Once your system is getting back to normal, this will help to sustain the healthy balance of optimal bacteria in your digestive system. Being Certified Organic by multiple International Organic Certification bodies - including ACO, USDA and Japanese authorities - means that all vegetable ingredients used in InLiven's manufacture are organically grown therefore contain NO synthetic chemical residues from agricultural processes, which ensures a high tolerance and reduced likelihood of any adverse reaction. It should be noted, for instance, that the product does include some ingredients that contain gluten - but because these are organically grown cereals they have been shown to be tolerated even by those who normally experience a problem with digesting gluten. IMPORTANT: In fact, research has show that in many cases gluten intolerance is probably triggered by the synthetic agricultural chemical residues in typical foods and even in OTHER supposedly super supplements BUT which are NOT present in InLiven. FINAL NOTE: A 150g tub of MiVitality Inliven wholefood supplement contains up to 50 portions - which means that the daily cost of taking a maintenance dose of InLiven costs only about GB£1 about US$1.90, or 1.2€. Not really that great of a cost as an investment in your essential digestive health when compared with the price of a glass of beer or a frappuccino, or a 'deadly' muffin... any of which would actively 'kill-off' good bacteria and encourage bad bacteria! This may sound technical - and I'm not aiming to get bogged down in the 'bio-chemistry' of the human body. However, it is simply the case that 'free radicals' are highly reactive atomic components -- or molecules that are in effect 'incomplete' (lacking an electron -- which they seek to replace by stealing 'oxygen' from cells) meaning that they are looking to complete themselves in most cases, when in the body in excess, through effectively damaging cells. Whilst a certain number of free radicals are actually necessary to effective metabolism the types of foods, and amounts of foods we eat can result in far too many being produced. This is when they become a real danger. Free radicals can also be created due to damage caused by ultra violet rays (i.e. when exposed to too much strong sunlight!) and other forms of radiation. Environmental and atmospheric pollution, such as cigarette smoke, combustion engine fumes and so on also produces free radicals in the system. This cell damage, caused by free radicals can become the trigger for unnatural cell growth. This would ultimately lead to tumour formation and hence potentially become diagnosed as one or another type of cancer. Therefore, it is a GOOD THING to try to stop the damage that excessive free-radicals do by trying to 'mop them up' and put them out-of-action before they can damage cells. The best way to do this is through taking super supplements such as antioxidants! Far from being truly super supplements some everyday foods and beverages do have noted anti-oxidant properties. Perhaps best known is 'good old' tea, and also coffee. These are relatively weak as far as being a source of anti-oxidants goes, however. In fact, more potently, there have been a number of 'super fruits' discovered that have caused a flurry of excitement and resulted in some 'over excited' marketing (that has also purportedly made a few fortunes) in recent years. Such fruits as Tahitian Noni, the Amazonian Acai, the Goji Berry, the Mangosteen and the venerable Pomegranate have all come in for great 'press' and has some so-called 'super supplements' made from them usually in the form of rather over-priced cordials or juices! Recently a product came to market that combined the best super fruit sources of antioxidants along with a few other intriguing ingredients and it is quickly establishing itself as a rather amazing example of one of the super supplements. The product contains a variety of Certified Organic ingredients including raw cacao, goji berry, acai and the fruit of the coffee bean (very low in caffeine but high in anti-oxidant properties). The products name? Berry Radical. Recent research by independent Laboratories has confirmed that one daily 'dose' of this super-fruit freeze dried powder (which retains all the 'live food' qualities normally compromised in the ultra-heat-teated juices and concentrates) contained well over 7000 ORAC units. The ORAC unit is the measure of 'Oxygen Radical Absorbance Capacity' That the supplement has. 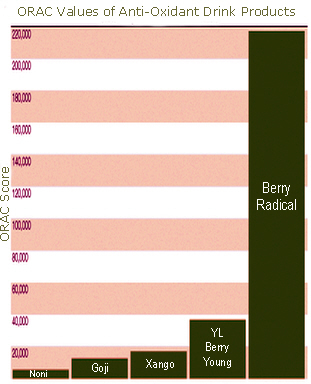 The MASSIVE ORAC value of a portion of Berry Radical essentially means that it has many times the potential of any of the competitive products currently on the market.